A slim yet good guide to linocuts for beginners at a very reasonable price. Every step is explained and you will quickly be able to make prints. Try your hand at 10 projects by using the full-size templates. You can also inject your own creativity and make your own designs. 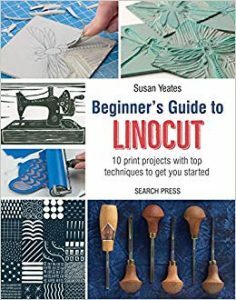 Find out about linocut, materials, workspace, techniques, projects and templates. Discover how to draw, cut, print and repeat. Great step by step instructions with colour photos making it so easy to follow. Fun projects. I found the section photograph to linocut very interesting. This book covers more than just the basics, including working with text and two-tone prints, printing wrapping paper, gift tags and cards, labels, colour blends and printing on fabric. Recommended for beginners.